Our Catfish Formula is naturally high in protein, healthy fats, and muscle building amino acids. It is also grain free and chicken free, which can be beneficial for dogs with food sensitivities or allergies. 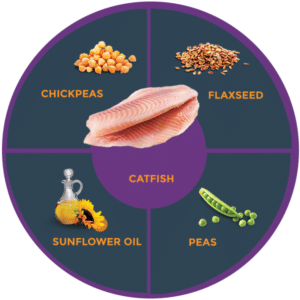 The high protein formula is closer to nature than foods that contain starches and carbohydrates, making our Catfish Formula a good way to regulate proper hormone levels, maintain lean muscle mass, and a healthy heart. It also has a great taste that your dog will love. Zignature® Catfish Formula – Learned from Nature, Crafted to Perfection. Catfish, Fish Broth, Peas, Chickpeas, Sunflower Oil, Agar-Agar, Tricalcium Phosphate, Calcium Carbonate, Choline Chloride, Salt, Potassium Chloride, Minerals (Iron Proteinate, Zinc Proteinate, Manganese Proteinate, Copper Proteinate, Mangnesium Proteinate, Sodium Selenite, Calcium Iodate), Vitamins (Vitamin E Supplement, Thiamine Mononitrate, Niacin Supplement, Calcium Pantothenate, Biotin, Vitamin A Supplement, Riboflavin Supplement, Vitamin D3 Supplement, Vitamin B12 Supplement, Pyridoxine Hydrochloride, Folic Acid), L-Carnitine.